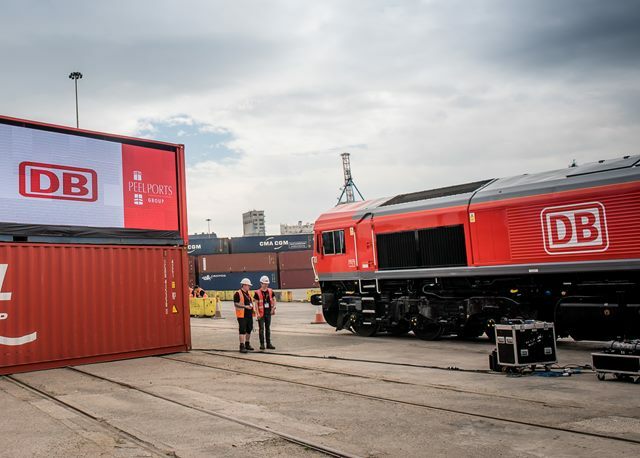 A new rail freight service for containers has left the Port of Liverpool for the 1st time, thanks to a partnership between Peel Ports and rail freight company DB Cargo UK which will see a reduction in HGV movements around Seaforth. The new freight service provides:- shipping lines, forwarders, tank operators and cargo owners, along with a seamless route between the quayside, at Liverpool and Scotland. Metro Mayor Steve Rotheram officially launched the departure of the inaugural journey, on Tuesday, 8 May 2018, which saw goods loaded in Liverpool and transferred to Mossend terminal in Glasgow for onward delivery to destinations across Scotland, a service that will return with Scottish exports that are destined for global markets. The new service, which is expected to make Scottish exporters more competitive, will comprise up to 30 wagons and is expected to carry over 40 containers per trip. The service will initially run on 3 days a week with DB Cargo providing the rail haulage to transport Scottish exports destined for global markets via direct deep sea routes from Liverpool. The move echoes Peel Ports Group's longstanding commitment to reducing road haulage miles locally around the Port of Liverpool. Peel launched a rail route between Liverpool and Drax Power Station in 2015, shipping biomass pellets to the site in North Yorkshire. Jouke Schaap, Container Director at Peel Ports, said:- "This new service underlines our commitment to minimising road haulage miles locally and across the UK. With a greater emphasis on efficiency and sustainability taking hold of the logistics market in the UK, we are proud to be leading the charge by reigniting freight routes between Scotland and the North West. We know that cargo owners are looking for more efficient ways of getting their goods from A to B, and this rail freight service provides them with a simpler, more cost effective and environmentally friendly way of doing that." 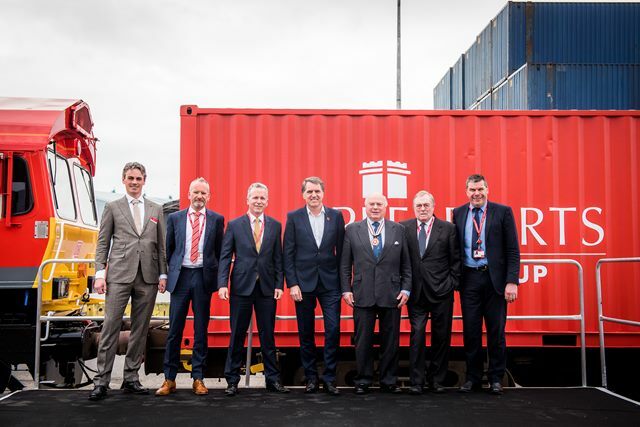 Metro Mayor Steve Rotheram, said:- "Improving our connectivity, both logistically and digitally, is a key driver in transforming the Liverpool City Region and this new rail freight service is an important part of that process. It also offers an environmentally friendly way of moving cargo arriving in the Port of Liverpool, by taking traffic off the roads. The prosperity of our City Region is intrinsically linked to the success of the Port of Liverpool, so it is great to see it respond to market demands on efficiency and sustainability in a way that benefits the wider community." Hans-Georg Werner, CEO from DB Cargo UK said:- "We're delighted to be working alongside Peel Ports on this exciting new initiative. Introducing express rail services between Liverpool and Mossend is a really sustainable solution, significantly reducing the need for HGVs to travel thousands of miles on our roads each week. Peel Ports' vision to offer customers a seamless end to end service resonates with our own drive for higher standards of service and flexibility for our customers. We look forward to seeing our partnership grow in the years ahead." The available train path capacity directly to and from the Port of Liverpool is currently amongst the highest of all major ports within the UK, providing expansion options for importers and exporters that also minimise cost, congestion and carbon emissions. The new rail service will complement Liverpool's wider logistics offering, such as multi-user warehousing, as Peel Ports continues its strategy of creating a truly multi modal logistics hub right in the heart of the UK and providing supply chain efficiency and reliability for our economy. All rail freight enquiries should be emailed to:- RailFreight@PeelPorts.Com or visit:- PeelPorts.Com/Rail for further information. Miss Southport and Miss Liverpool City Region Finals just days away! SHOW our support for those taking part in this year's Miss England, Miss Southport and Miss Liverpool City Region Finals and also have an amazing night! This fantastic event will take place on Friday, 18 May 2018. It's going to be a splendid night's entertainment... Not only is it your chance to see who will become your ambassador for Southport and the ambassador for the Liverpool City Region at this year's Miss England, but you might also see the Next Miss World! Plus the night will feature a host of entertainment, from Astrid, who is only 8 and is a fantastic Jazz/Blues singer who is to be on TV very soon and the stunning Charlotte Gallagher, plus the amazing Livy K, who has just returned from recording and filming in the USA! Not only that, Miss England Contest 2016, Elizabeth Grant, will be hosting the event... So book your tickets now! For tickets call the Liverpool Olympia on:- 0151 263 6633.